This year marks 30 years since the Russian River Valley got its official status as an American Viticultural Area or AVA, a recognition that declares the area—with its warm days, cool evenings and foggy mornings—has something unique to offer in its wines. In that time, the Russian River Valley has transformed from a relatively unknown area only beginning to garner respect for some surprising Pinot Noirs to a world-recognized region making world-renowned wines. No single entity has been a bigger proponent of that perception shift than the Russian River Valley Winegrowers. Area growers and vintners formed the non-profit education and marketing organization in 1994 to spread the Russian River Valley gospel. Passport to Pinot – Over 30 Russian River Valley wineries will be participating in the Passport to Pinot weekend, June 7-9, which will showcase the history, wines, food and laidback culture of the area. The weekend will open with a Friday night showing of “From Obscurity to Excellence: The Story of Grapes & Wine in the Russian River Valley,” a documentary about the rise of the Russian River Valley. On Saturday and Sunday, participants will be able to get unique views of area wineries with food pairings, barrel tastings, vertical tastings (comparing the past, present and future of a specific vineyard), artist demonstrations and tours of the vineyard. Make sure to stop by neighboring Joseph Swan Vineyards and around-the-corner vineyards Harvest Moon Estate & Winery and Hook & Ladder Winery. 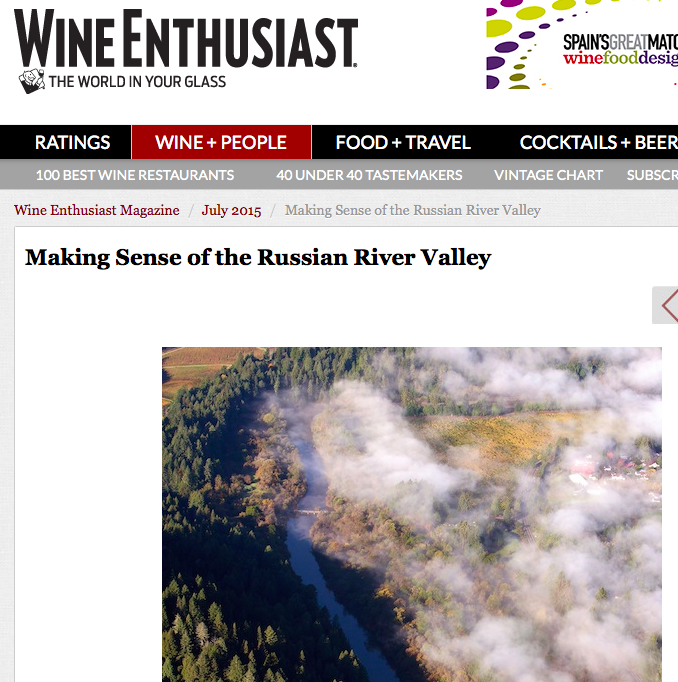 New RRVW website – We were thrilled to see the unveiling of the new Russian River Valley Winegrowers website this month. With better visuals showcasing the Russian River Valley, more interactivity for the members (soon people will be able to link to our Facebook, photos and videos directly from the RRVW site), and more info for consumers hoping to explore the area, the site helps area growers and vintners keep in touch with those who aren't here to touch the dirt and mosey up to the wine-tasting bar. Single Vineyard Night – This event that focuses on introducing the Millennials to a Russian River Valley vineyard will be Thursday, Oct. 24 at the General’s Residence at the Fort Mason Center in San Francisco. Pinot Classic– This new event June 12-15, 2014 will highlight the Russian River Valley Pinot Noir, which caught the world’s attention in the 70s and helped carry the Russian River Valley to its place of prominence. The multi-day event will feature winemaker dinners at area restaurants, industry seminars, Passport to Pinot and a one-of-a-kind Paulee dinner, where invited guests will bring prized bottles of wine to share. The event will culminate with a barrel tasting, auction and dinner hosted at Williams Selyem Winery.